I am sure I do not need to tell any of you mummies out there at how much pride I was filled with when Soeren presented me with these eggs on Easter Sunday. He had made these creations at his KIGA with his group. 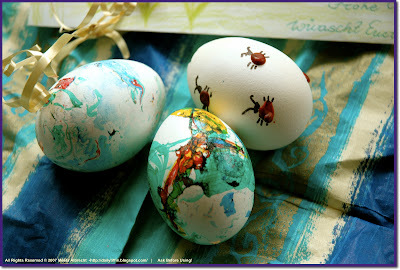 Lovely delicate artwork on each egg blown out egg from a 4 year old. Yes, I just had to share this with you so you can share my joy and pride with me too. Today's Tiffin idea is put together quickly as I use mostly leftovers. Fresh strawberries and kiwis cut up in bite sized pieces. Rich in vitamin C, E and fiber. Not to mention their potent antioxidant protection. My mum constantly sends me packets of cashews, almonds and raisins from Dubai as she knows how much we enjoy them. Here I have made a little dried fruit and nut mix with a few cashews, almonds, raisins, hazelnuts and dried cherries. My mother calls this "brain food." The cake is a almond and vanilla cream sponge cake, made very easily using pre-prepared sponge bases and whipping up a pastry cream of your choice. Sprinkle with roasted almonds to top it off. Finally two slices of a wonderful fluffy egg roll I made for our Easter Brunch. The roll is filled with wasabi flavored cream cheese and smoked salmon. You will find the recipe here. As of now Tiffin Tuesday is going to be a regular weekly session here at the Dailly Tiffin. 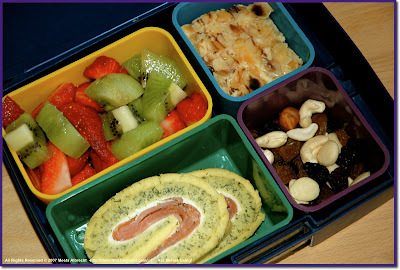 Every week we will present you with a variety of different lunch box ideas. For this purpose we have invited two lovely ladies to join us on our team. Biggie has joined us as a co-admin and will be bringing you exciting and useful tips on lunches she packs for herself and her two-and-a-half year old son. On April 23rd catch her first article right here on the Daily Tiffin. I've been living in San Francisco since 1999 (after living in Japan for nine+ years), my son is two and a half, and I'm now a stay-at-home mom since the arrival of my son (after a career in high-tech PR both in Japan and San Francisco). On the other Tuesdays you will be getting more lunches boxes, bentos and packed lunch ideas from a new regular contributor to the Daily Tiffin. Joker Girl who packs the most healthy nutritious vegetarian bentos will be sharing a few of her secrets with us. Next week she will be premiering with a detailed look into a Bento Box. I'm a 24- year old software engineer from Austria who lives in Sweden and likes to play with her food. International cuisine and photography are probably the most feminine of my hobbies, which combine well in making cute lunchboxes! Makes you wonder what her non-feminine hobbies are LOL! We are really glad to have these brilliant new additions to the Daily Tiffin. wow. soeren is an artist. those look gorgeous. When I first saw them I thought you would hve helped him do it especially the ladybird one!And now to know that it was all indeed made by little Soeren.......I shouldnt be surprised,afterall he is your son!